Aww!! I love friendship moments outside of filming projects. The princess of drama theme songs in recent years, Della Ding, recorded the themesong for Perfect Couple with Wallace Huo earlier this year, and the two have become good friends since then. Last night, he appeared at her Live Concert in Beijing and performed “Good Times” in a perfectly fitted navy suit. In other news, why don’t pop groups ever come to the East Coast to perform?!! I’m dying to attend a concert! Also known as Da Mo Yao or Legend of the Moon and Stars. 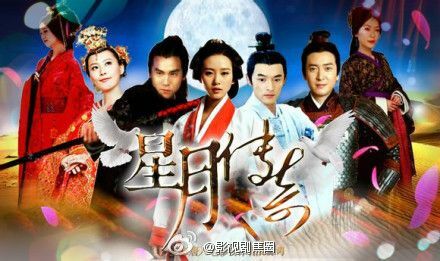 The themevideo is released, which is a positive sign that the drama will be out soon. As I said before, I’m liking Eddie Peng the more I see of him in here. Sorry Hu Ge, you look so bored in the role that I can’t help but mirror your expression when seeing you onscreen.